Juliette is down to earth and up to mischief. This woman is here to shake things up, to facilitate embodiment and open hearts wide to the wonder and unbound potential inherent in the substratum of the life we are. 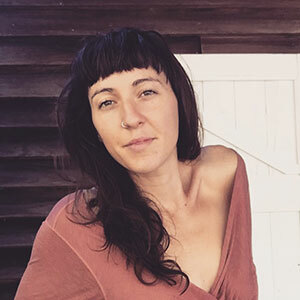 She is an artist, a rebel and a devotee to the infinite mystery in her work as a doula, massage therapist, embodiment educator, yoga facilitator, meditation teacher and yoni mapping therapist. Her heart qualifications bound forth from the living of a vivacious, heart-on-her-sleeve kind of life. Her transmission of compassion for the aches and ecstasies indigenous to the human soul and psyche is palpable and soothing. Juliette lives a healthy active present and artful life. Outside of work she is a gardener, a dancer and a sculptor of prayer through paint and poetry. Juliette is passionate about serving relaxation, a return to wholeness, and the experience of total absorption in love for all women. “Juliette is a powerful space holder. I felt so nervous/excited/nervous leading up to my session but as soon as I meet Juliette I knew I was in good hands. Its not easy for me to have conversations about my body/sexuality, let alone have anyone work so intimately with me. But I’m so glad I followed my heart!